The coaches of the Lucknow Metro Rail Corporation would encapsulate the rich cultural heritage of the City of Nawabs. LMRC had on Monday unveiled the two dimensional design and three-dimensional mock-ups of Lucknow Metro train in the presence of Uttar Pradesh Chief Minister Akhilesh Yadav. 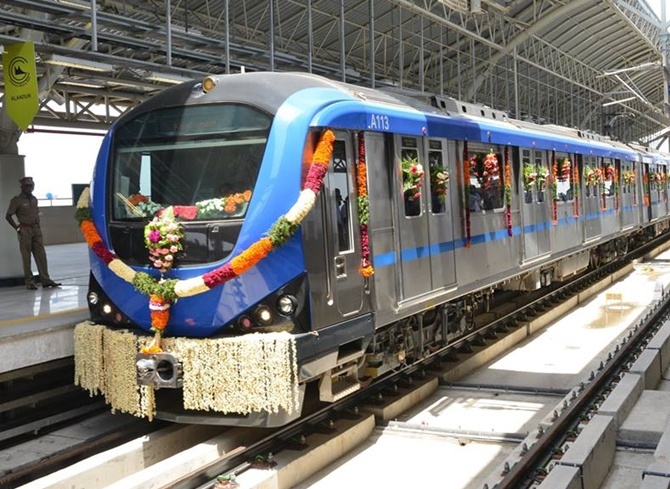 A French multinational is making the trains at its Sri City facility in Andhra Pradesh. The signalling system is being jointly supplied by Alstom’s sites in Bengaluru and Saint-Ouen, France. The front of the Metro has been conceived to portray the essence of some of Lucknow’s most iconic monuments, including Bara Imambara, Asafi mosque and the Roomi Gate, which is the signature edifice of the city. Each four-car Metro train would be able to carry 1,100 passengers at a time. There are provisions for 186 seats. Two dedicated zones for the differently abled, wheelchair spaces, braille stickers for the visually challenged and talk-back buttons for easy entry and exit make the Metro system accessible to a wider audience. In September 2015, LRMC had awarded a contract to Alstom to supply 80 Metro cars for 20 train-sets of four cars each for the North-South Corridor of the Lucknow Metro Phase-1A project, covering 22 stations. The priority section of the 8.5-km stretch from Lucknow airport to Charbagh railway station, costing about Rs 2,000 crore or Rs 20 billion, is nearing completion and trail runs are scheduled from December 2016. The coaches for Lucknow Metro are likely to start arriving from October 2016. The Metro train’s exterior golden-hued design has been inspired by the traditional Chikankari craft of Lucknow. The blending of black in front has been inspired from the modern feel of Hazratganj, Lucknow’s main commercial hub in the heart of city. The design criteria for selection of cars for LMRC were energy efficiency, reliability, comfort, lower noise level and environment friendly, Keshav said at the occasion. The body shell of cars has been made of lightweight stainless steel. An energy efficient train with LED lighting and regenerative braking to feed energy back to an overhead electrical energy system during braking has also been planned.